ຂໍຂອບໃຈກັບ David Zepeda ຂອງ VVCP ສໍາລັບການເຮັດໃຫ້ GeoBee State Finalist ແຫ່ງຊາດ GeoBee! ຊົມເຊີຍກັບ Valley View Charter Prep 2018-19 National Merit Finalist, Tyler A. ! 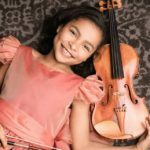 Suthter Peak's 10 ປີເກົ່າ Amaryn Olmeda violin prodigy!